There used to be a pretty exciting center of entertainment in Mendocino. The establishment, located on the corner of Ukiah and Lansing Streets at Kelliowen Hall, was owned by Joseph H. Nichols. Candy could be purchased, movies viewed and patrons could practice their skating skills. There was also a pool room for the men of the town. 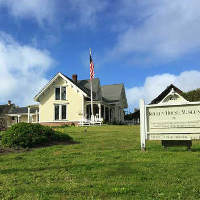 On November 20, 1909, the Beacon reported that Mr. Nichols had been granted a concession within the large building by the trustees of the Mendocino Library Association. The “confectionery and refreshment stand” were located in the front room of the building. The newspaper’s notice stated that Mr. Nichols would “have charge of the gymnasium and the men’s billiard and amusement room.” Prior to the award of this concession, Joseph H. Nichols had worked as a fireman for the Mendocino Lumber Company’s mill. In 1891, he married Mamie Nelson, a native of Mendocino, in San Francisco. The couple had many children, not all of whom survived to adulthood. One day, an unknown photographer stepped inside and arranged to take this photograph. With all of the improvements made for his customers, it is surprising that Joseph Nichols had time for a photo. The billiard room was clearly a gathering place. The walls were papered, a stove was provided for warmth, chairs could be drawn up around a small table for card games. 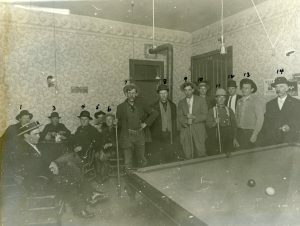 Three of the men in the photograph hold cue sticks: Bill Emerick, Leslie Flood and Vick Boos. Proprietor Nichols is standing to the left of Vick Boos. Every man wears a hat. There are electric bulbs suspended by long wires from the ceiling. The sign above the table where card players are seated reads “Don’t Spit on the Floor.” Noticeably absent from everyone’s hands is a drink. The photograph may have been taken in 1910, after the passage of the ordinance to make Mendocino dry and alcohol free. Pictured are: John Chambers (1), Simon Fraser (either 2 or 3), Roy Doolittle (4), Jimmie Baskerville (5), Frank Bailey (6), Bill Emerick (7), Emil Seman (8), Leslie Flood (9), unidentified (10), Vick Boos (11), Arthur Daniels (12), Joseph Nichols (13), and Sam Bever (14). John Chambers had a blacksmith and wagon shop, as did Emil Seman, another blacksmith in Mendocino. One of Emil Seman’s daughters, Senie, married Arthur Daniels. Then as now, in a small town and over time, everyone became known to just about everyone else.